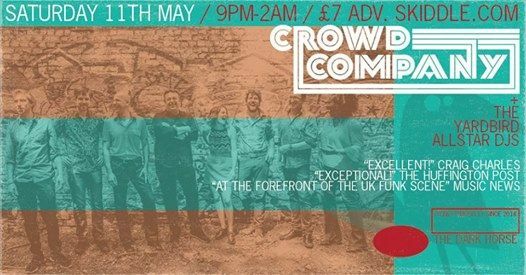 A modern take on vintage soul and funk from acclaimed 8 piece band Crowd Company. Brimming with energy, catchy hooks and tight grooves..the band combine a Hammond organ based sound with a virtuoso horn section and 3 outstanding soulful singers. The band released their latest album ‘Stone&Sky’ on the Vintage League Music label, produced by Alan Evans (of Soulive). Having performed at The 100 Club, Band On The Wall, The Jazz Café, Brooklyn Bowl, Concorde2, Mostly Jazz Funk Soul Festival, Norwich Arts Centre, Pizza Express Jazz Club, The Borderline, Green Meadows Festival, Cambridge Junction (Craig Charles Funk&Soul night), Brixton Jamm (Craig Charles Funk night), Hootenany, The Wardrobe and provided touring support for the likes of The Meters’, George Porter Jr UK Tour, Soulive, Monophonics and Corduroy..we at The Yardbird are delighted to get this heavyweight band on the Dark Horse stage! Plus support from The Yardbird Allstar DJs spinning all vinyl deep funk/latin soul/funky beats & grooves until 2am. 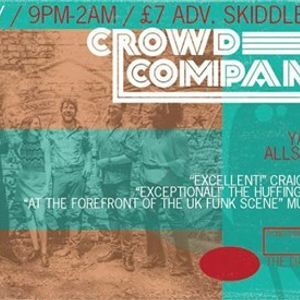 £7.00 advance from skiddle.com / more on the door.